One of the promises of the Atomic Age was the notion that, one day, we would all be riding around in nuclear-powered cars, trains, and airplanes. Even if our roads were never filled with nuclear cars, many designers came up with prototypes and concept art for atomic transportation. 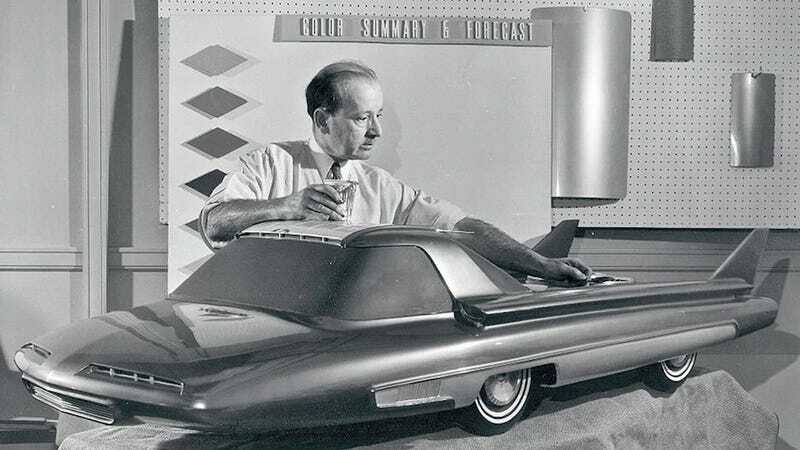 This 3/8th-sized scale model concept car was to be powered by a nuclear reactor (uranium fission-heated twin steam turbines) in the rear and was supposed to go 5,000 miles without refueling. The converted B-36 bomber (XB-36H, named The Crusader) of the U.S. Army carried an operating three-megawatt air-cooled reactor. It held a crew of five: a pilot, a co-pilot, a flight engineer, and two nuclear engineers. Tested between 1955 and 1957. "It made 47 flights over Texas and New Mexico between July 1955 and March 1957). The NB-36H carried the reactor in its aft bomb bay and incorporated a new nose section, which housed a 12 ton lead and rubber shielded crew compartment with 10-12 inch (25-30 centimeters) thick leaded-glass windows. Water pockets in the fuselage and behind the crew compartment also absorbed radiation (due to weight constraints, nothing was done to shield the considerable emissions from the top, bottom or sides of the reactor)." – according to the Brookings Institute. The right nuclear engineer's panel with a TV monitor installed in the center top bulkhead allowed engineers to visually inspect the engines and wings in flight. "This particular prototype was to be powered by a 'genestatom', a 40-KW nuclear thermal generator using radioactive cartridges made of nuclear waste. Fortunately, the French government did not approve the use of nuclear fuel and the car never made it into production. And here we are worrying about CO2 emissions!" – according to FleetAlliance. The idea of a transportable electric station was born in the mid-1950s in the Leningrad-based Kirov Factory, but the first working station only started producing energy in 1961. Its turbine generator produced 1.5 megawatts. Some tests were done in the 1960s, but the unprofitable project was ended in 1969. The only prototype built had four turboprop engines and an onboard nuclear reactor. It completed over 40 flights until 1969. Most of them were conducted with the reactor shut down; the engineers only tested the radiation shielding. The project was cancelled in 1969. The first six-wheeled car, the Ford Seattle-ite XXI, designed by Alex Tremulis for the Century 21 Exposition (also known as 1962 Seattle World's Fair). It had some weird ideas like computer navigation, interchangeable fuel cells, automatic information systems, and a possibility of "compact nuclear propulsion devices."